The PSL Strip Light system can operate in or out of water and therefore is completely aquatic and can be used in any application due to its flexible design. This totally New Concept provides a very even diffused light source similar to neon lighting and much better than the cheap Rope light systems on the market. 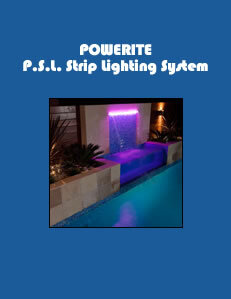 With its unique design the new PSL strip light can be used in new and Existing Waterfalls (Aqua-Blade) and all types of water features.